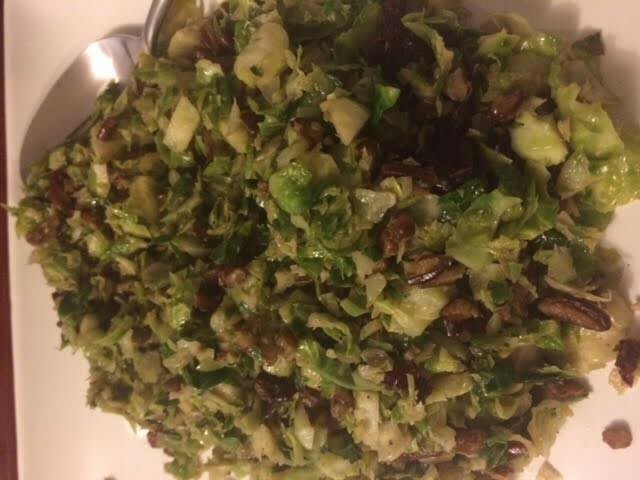 Brussels Sprouts with Cranberries and Pecans | Om nom nom! This was a festive side dish to go along with a tenderloin roast for our Christmas dinner. Quick and easy, but it was definitely a hit – my Mom even asked for it at every holiday meal from now on! As much as we like sprouts, I think we can make that happen. 😉 This is a good old Alton Brown recipe. Run the sprouts through the food processor until coarsely chopped/shredded. Set a pan over medium-high heat and add the pecans until toasted, about 2-4 minutes. Add the butter to the pan and stir to combine. Once the butter has melted, add the Brussels sprouts, salt and pepper and cook, stirring continually, until the color brightens and the sprouts are just tender, about 5 minutes. Remove the pan from the heat, add the cranberries, toss and serve.